BANGKOK: Immigration police at land border crossings have now stopped giving entry stamps to foreigners who exit and immediately return to Thailand to extend their stay for 15-30 days on visa runs. “The order is not new. Originally, officers were authorised to consider giving permits. But in this current situation of heightened security, all officers have to step up restrictions,” said an official at the Immigration Bureau. Many foreigners regularly go on visa runs to Cambodia and return through the Sa Kaeo immigration checkpoint, he said. “Some foreigners do not even go themselves, but get illegal networks to obtain the entry stamp for them,” the source said, adding that the government has cracked down on the border-run syndicates, prompting them to change tactics. Now the networks provide a one-day tour for foreigners to the Cambodian town of Poi Pet, so they can re-enter Thailand afterwards with permission to stay for another 15-30 days. Law enforcement on these types of activities will intensify, said the source. From now on, foreigners who are re-entering Thailand will be screened rigorously. They will need to provide information about their accommodation, tour company or other details to confirm they are in the country to travel as tourists. 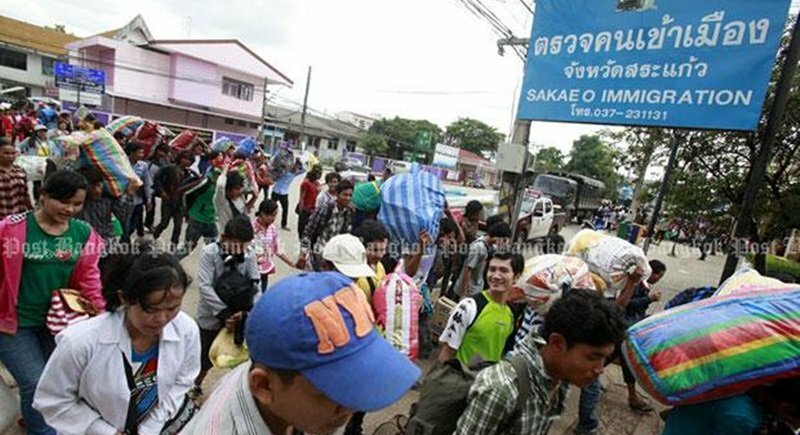 The measure is likely to block scores of foreigners from re-entering Thailand through Sa Kaeo. Those wishing to enter Thailand from Cambodia will have to go to Phnom Penh to apply for a visa at the Thai embassy. The police investigation into the bomb blasts at Erawan shrine on August 17 and the Sathon pier on August 18 discovered immigration police were bribed by an illegal network linked to the perpetrators. The issue prompted national police chief Pol Gen Somyot Poompunmuang to call a meeting with the heads of immigration checkpoints on Sept 7, and was followed by a reshuffle in immigration police staff. “The immigration police are coming under intense scrutiny,” said another high-ranking official at the bureau. Some army-backed officers were moved to head up the checkpoints in the recent reshuffle. Pol Gen Somyot is now wrestling to oust bureau commissioner Pol Lt Gen Sakda Chuenpakdee, who allegedly failed to follow the government order to transfer officers linked to Rohingya traffickers out of his jurisdiction. Pol Gen Somyot also handed out a report exposing the unlawful practices of immigration police under the command of Pol Gen Sakda, such as allegedly accepting B300-500 bribes from foreigners cutting the queue to apply for visas at Suvarnabhumi airport, the source said. The practice is said to make about B2 million in profit for the immigration police every day. “Pol Gen Somyot aims to destroy the treasure trove plundered by the bureau,” the source said. So instead of terminating their employment with government (for life) and arresting-prosecuting the alleged guilty for criminal corruption the alleged guilty are "reassigned"? I will not express mine as it would be a criminal offense in this country with no free speech that is considered a basic human right in all developed countries.